TERRE HAUTE, Ind. -- A role on the international stage may be in the future for one Indiana State University graduating senior, who prepared for the future by making the most of her opportunities. Sadie May Davis, a political science, legal studies and women's studies major from Martinsville, has embraced learning - both inside and outside the classroom - since arriving on campus as a freshman. As a student at Martinsville High School, she became interested in Indiana State due to a friend being a President's Scholar. Davis knew she met the qualifications to apply for the award, so she applied at ISU in addition to two other schools. Like the story "Goldilocks and the Three Bears," Davis found one school to be too small, another school was too large. Indiana State was just right. "The size of the school, along with the personal attention I would receive was the perfect balance. Indiana State was a good fit," she concluded. Once on campus, she got involved right away, serving in Student Government Association's freshman council and as a senator. "I did Student Government Association, but I wanted to experience more," Davis said. She began working as a learning community peer advisor and mentoring freshman students. "Freshmen are my favorite people," Davis said. "It's amazing to see them come on campus and be able to pursue so many interests." 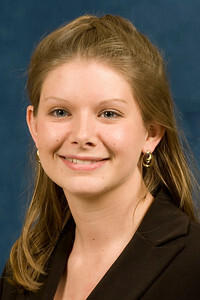 She kept involved with Indiana State's American Democracy Project, attending "Pizza and Politics" sessions and even attending a luncheon with the governor to promote the program. Davis learned about politics first hand by attending the 2008 Democratic National Convention. 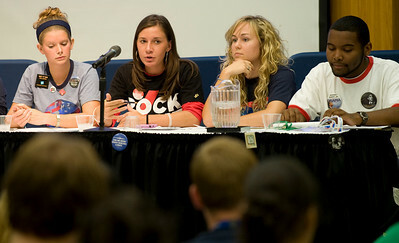 Prior to the fall election, Davis and other Indiana State students who attended the national conventions staged a presidential debate of their own, to actively engage fellow students in the political process. "It was a rewarding experience that I will never forget,"Â she said. What has kept her the busiest, is working on campus -- Davis worked for the Office of Admissions and First Year Programs, assisting with orientation and fall welcome; served as an editor for the Indiana Statesman for a semester and works on behalf of the University Honors Program. She has also participated in a number of community activities, including the Martin Luther King Day of Service, Hull House Service learning Trip, Take Back the Night, Global Youth Service Day and World Food Day. Her learning extended far beyond Indiana State's classrooms -- to San Jose, Costa Rica, where she studied for one semester. "I knew I wanted to study abroad," Davis, a student in the University Honors Program, said, adding she wanted to take advantage of experiencing a new culture. She wanted to go to Australia at first, but ultimately decided to study in Costa Rica in spring 2008. "I went through several evolutions, and decided to turn my back on my French and English background and go to Costa Rica," Davis said, adding she managed to squeeze a semester of Spanish in before leaving. 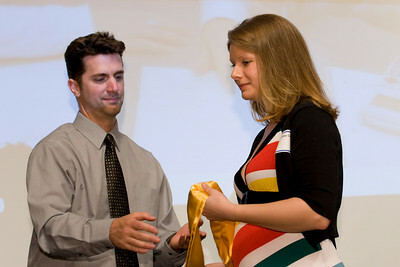 In Costa Rica, she took Spanish classes four hours a day and took an elective course in Human Rights in Latin America. "I was fully immersed in a new culture," she said, adding she stayed with a family that spoke Spanish and knew no English. "Luckily, I had a housemate to translate for me for the first couple of weeks," she said. The experience was rewarding on several levels. "I got to meet so many great people, see a lot of the country and experience a new culture," she said. "I'd like to go back." Davis will reflect on her experience as a Sycamore May 9, as student Commencement speaker. While drafting her address, she struggled with the message she wanted to convey. "I was trying to write my speech two nights before the audition and I needed a theme," Davis said. She thought back to a speech she wrote as a student at Martinsville High School about shoes. The speech was so successful that she went to national competition with the school's Academic Decathlon Team. "Why don't I do something about shoes," she recalled. "I focused on the advice mothers often give their daughters -- a good pair of shoes, if you take care of them, will take you anywhere." She took that advice and created an analogy to describe her experiences at Indiana State. She linked shoes in her closet to experiences on campus and beyond -- a silver pair of flip flops represented her time in Costa Rica and retrieving a Frisbee in the fountain during orientation, high heels reflected experiences as a President's Scholar, her time at the Democratic National Convention and high profile events on campus, such as meeting Jeffrey Toobin who spoke on campus as part of the University Speakers Series. Her tennis shoes represented the everyday experiences on campus and the friendships she's developed with faculty, staff and students. "If you take care of Indiana State, Indiana State will take care of you," she concluded. Her message isn't all about her experiences; it is a message all students can relate to, regardless of their experiences. "It's about all students who have become engaged on campus and their communities," Davis added. As she leaves Indiana State, Davis has some sage advice for incoming college freshman and current college students. "Academically, challenge yourself. Try different classes and don't get too attached to your major. Learn for the sake of learning," she said, adding she could've saved herself a lot of stress had she learned that early in her college career. 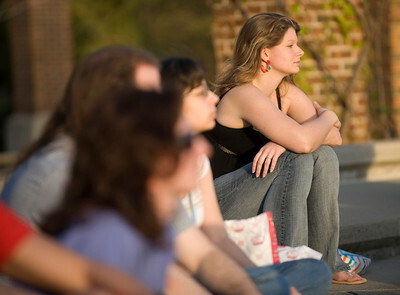 In addition to getting involved on campus, Davis suggests that students explore the possibilities. "Do things you don't normally do," she said. "I wouldn't have ever guessed that I could attend the Democratic National Convention but all I needed to do was write a letter expressing interest." In addition to delivering the student address at Commencement, Davis has received another honor -- an Alan C. Rankin Award. Named for ISU's seventh president, Alan C. Rankin, who served from 1965-1975, the Rankin Awards recognizes outstanding members of the senior classes who have contributed to the betterment of campus life at ISU. Individuals selected to receive the awards must have a cumulative grade-point average of at least 3.25 and have demonstrated dedicated membership and leadership ability in campus organizations, as well as in the community. Davis will enter the top-rated Maxwell School at Syracuse University this fall, enrolling in a dual degree program in international relations and public relations. The program, roughly three years old, will allow Davis to earn essentially two master's degrees in two years. In addition to earning a degree in the two areas that interest her, she's looking forward to the program's culminating experience. "I'll spend my last semester in Washington DC serving an internship," she said. Given her area of interest, she'd like to stay in the nation's capital. "I'd like to play a role on the international stage one day," she said. A role on the international stage may be in the future for one Indiana State University graduating senior, who prepared for the future by making the most of her opportunities.